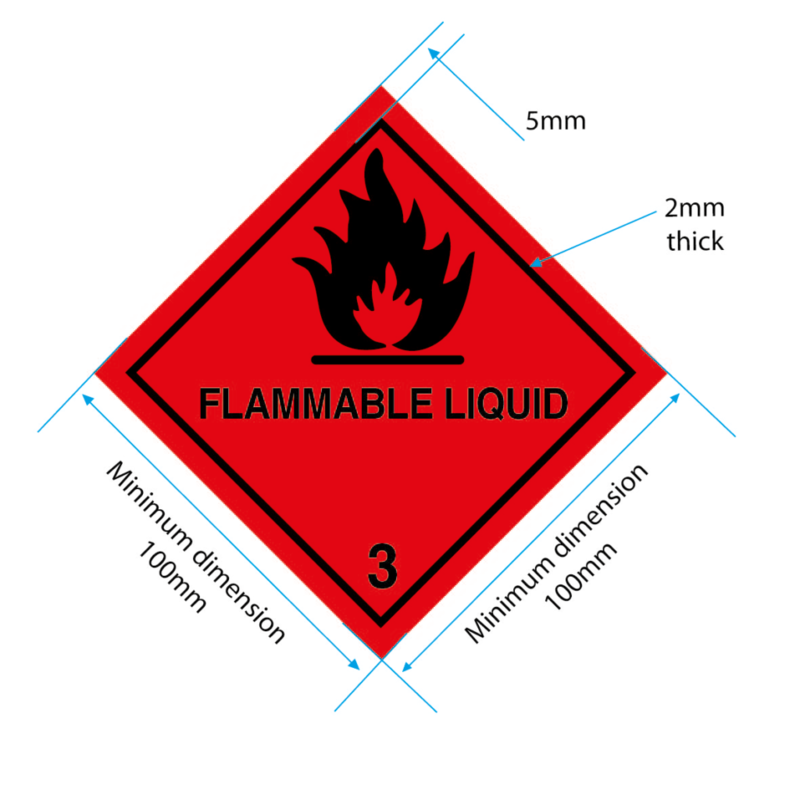 Flammable Liquid Labels - Class 3 Label & Placard. Buy Online! The EU has passed numerous directives and regulations to help keep people safe when using and transporting potentially hazardous flammable substances and there are long-standing treaties such as ADR and RID that regulate their transportation by road and rail. An important part of ensuring the safe transportation, and end use, of flammable liquids is their correct labelling and marking through the flammable liquid class 3 label and placard. WHAT ARE CLASS 3 FLAMMABLE LIQUIDS? If you’re involved in the processing, packing or transporting of dangerous goods, you will first need to classify them correctly so that all organisations in the supply chain, including the emergency authorities, know and understand exactly what the hazard is. Under the UN recommendations, there are nine danger classes for hazardous goods and it’s Class 3 that covers flammable liquids and liquid desensitised explosives. These liquids are usually determined by their flashpoint (FP). The flashpoint is the lowest temperature at which just sufficient vapour is given off to be ignited when coming into contact with a naked flame. The UN classifies goods as Flammable Liquids when the flashpoint is below 60°C and when they support combustion (be able to catch fire and continue to burn) above 35°C. The flashpoint is determined by a closed cup flashpoint test. Flashpoints can be altered by the presence of impurities in the liquid and so most substances in Class 3 are regarded as chemically pure. The UN also classifies goods with flashpoints >60°C, when carried at a temperature exceeding their flashpoint, as being Class 3. ADR & RID follows the UN classification, except certain fuels are still considered as Class 3 even if their flashpoint exceeds 60°C (but does not exceed 100°C). Liquid desensitised explosive (whether flammable or not) are also assigned to Class 3. These are explosive substances which are dissolved or suspended in water, or other liquids, to form a homogeneous liquid mixture to supress their explosive properties. Flammable liquids are mostly used as fuels in engines for motor vehicles and aircraft, and as such represent by far the largest tonnage of dangerous goods moved by surface transport. They are also used in much smaller quantities as a medium for paints, varnishes, inks & adhesives, as well as being used as chemical intermediates. Some flammable liquids are derived from petroleum, such as petrol, paraffin and solvents, whilst others are manufactured through natural or industrial processes, such as alcohols. The Flammable Liquid Class 3 label for packages must be at least 100 x 100mm, from edge to edge, and set at an angle of 45°. The label must show a dotted outer boundary line (unless it is being applied on a background of contrasting colour). The class number ‘3’ must be shown in the bottom corner and be in text at least 12mm high. Additional text saying ‘Flammable Liquid’ may be shown in the bottom half of the label, but this is not mandatory. The inner black line of the Class 3 label must be at least two millimetres thick and there must be a gap of 5mm between this and the outer dotted border or the outer edge of the label. The upper half of the label must contain the flame symbol. The line, flame symbol and text can either be all black, or all white, on a red background. 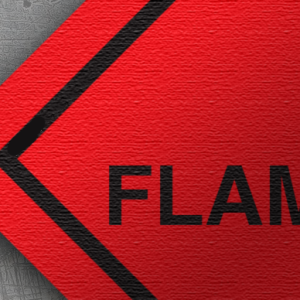 The Flammable Liquid placard is used for cargo transport units such as freight containers and road/rail tanker vehicles. Class 3 placards must be at least 250mm x 250mm, from edge to edge, and set at an angle of 45°. The placard must show a dotted outer boundary line (unless it is being applied on a background of contrasting colour). The class number ‘3’ must be shown in the bottom corner and be in text at least 25mm high. Additional text saying ‘Flammable Liquid’ may be shown in the bottom half of the label. There is no specification for the thickness of the inner line, as yet, but there must be a gap of 12.5mm between this and the outer dotted border or the outer edge of the label. The upper half of the label must contain the flame symbol. The line, flame symbol and text can either be all black, or all white, on a red background. All of the Flammable Liquid Warning Diamond Labels and Class 3 Placards manufactured by Stock-Xpress comply with IATA/ ICAO, UN ADR/RID and IMDG/IMO requirements, and are made from materials that meet the strict BS5609 standard. BS5609 is a specification for labels that are intended for marine use, whereby both the ink and the substrate must be able to withstand 3 months continuous immersion in sea water and still be legible and have good adhesion. We manufacture the Class 3 label at 101 x 101mm on rolls of 250, and as single cut labels at 100x100mm. Class 3 placards, for use in international transportation, are supplied at 250x250mm and 200x200mm for UK transport only.